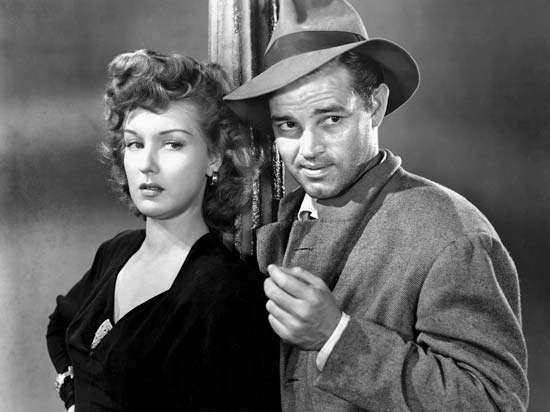 Detour is a legendary film noir. Actually it’s probably best described as notorious. Shot on two cheap sets over a short period of time, the star didn’t really get along. Star Tom Neal’s personal life was a real life noir with him getting blackballed after beating up star Franchot Tone. Year later he went to prison for murdering his wife. The dark tone of the film echoed through the lives of the people in and around the film. It one of the most referenced films ever since its bad rear screen projection has be made fun of or used as a trope in countless films. The plot of the film has a gambler Tom Neal on the run. Hitchhiking out of town he is horrified when the guy he is traveling with dies mysteriously. Fearing the cops he takes on his identity only to end up being blackmailed by a bad girl. Things rapidly go even further downhill even faster. A favorite of people across the globe including many big name filmmakers, Detour is the quintessential noir. If you want to know what Noir is see this film because once you see it you will completely understand what the film is. Personally I like the film but I don’t love it. There are too many other B crime films I like more. I know that may sound like sacrilege but by the time I saw the film it has being so highly touted that nothing could live up to the hype. Still if you’ve never seen it you should make the effort to see it since it is part of film history. With all the things that the film is also legendary for one is being in the public domain. It is the first film that most people associate with the term. The film was not properly copy-written with the result it’s been a staple of the revival and home video market for decades since everyone could put it out or run it with having to pay royalties. This has resulted in pretty much everyone having seen it, but largely in really bad prints. The fact that the New York Film Festival is showing it is a big deal since you will finally get to see it in a good print. This is important because seeing it in a good print gives it a weight that that the poor prints don’t really have. Despite my lack of deep love for the film, I find that my like for the film is greater when I see a really good print. NYFF is showing a really good print and as a result the screening on October 9 is recommended.